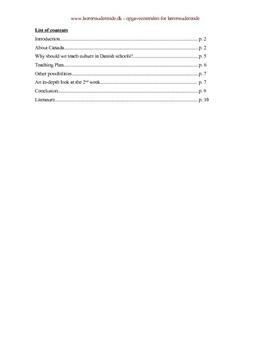 The semester assignment contains a section about Canada and the country's history, politics, geography, culture and a section about why we should teach culture in Danish schools and how we can develop intercultural competence and how learning about Canada can be a help to that. The last section in the assignment contains an education program for one of the older classes about Canada. If America is Gods country, Canada is the Paradise! We have chosen to write the semester assignment B. We had to choose a country, a political event or something that had happened in the history, which we thought was interesting. Whatever we chose we should make an education program about. We have chosen to write about Canada because it was the one country that really caught our interest when we made student presentations in our English lessons. Canada is a multicultural country. The nation is divided in two, one part speaks English and one part speaks French as their mother tongue. The country has a fascinating history. Canada is also interesting because we think that the country is a bit neglected, it is always the USA that is mentioned, when people talk about North America. To be international and to talk with people from all over the world, it is a good idea to learn about other countries and their culture and being able to speak different languages. That is what gives us the special talent called an intercultural competence. Canada is a federal state with ten provinces and three territories. The form of governance is parliamentary and the prime minister is head of government. Materialer relateret til Canada | Semesteropgave og undervisningsforløb.